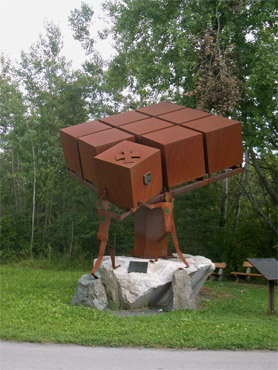 The Austrian's memorial to a regional struggle. Unlike the somewhat blurry transition between Italy and Austria near the Dolomites--a transition muted by shared alpine culture--you know when you've crossed the line drawn between Austria and Slovenia. The differences in their respective relationships to their histories are just as prominent as the differences from having been on opposite sides of the east-west divide in the Cold War Era. We are always a bit shocked at how, for the most part, the Austrians have swept the World Wars under the rug. In Germany, their culpability in war, especially in WWII, is ever-present. Museums, street memorials, TV specials, and international cemetery programs chant the mantra: "We did this, don't let it happen again--anywhere." In Austria, the national posture is more like "War, what war?" The only roadside, war-related memorial we stumbled upon during this last visit in Austria was to a local, post-WWI struggle--a struggle that was resolved by a vote in 1920 rather than by bloodshed. . It's a gentle, affirming memorial celebrating a happy, orderly end to a bit of unpleasantness in which Austria was able to take back a region that was formerly a part of Slovenia. (The WWI outdoor war museum we visited in Austria required an hours-long pilgrimage to a mountain top). In contrast, in our first minutes in Slovenia, we encountered a grim, stark memorial that echoed the horrors of WWII. It honored the suffering of those who built the mile-long tunnel we had just passed through, a tunnel built by prisoners of the notorious Mauthausen, Austria concentration camp. The border between Austria and Slovenia is within this tunnel and yet there was no mention of the ugly bit of history on the Austrian side, only on the Slovenian side. Later in the week, we were pausing to read a memorial to a remote Slovenian village massacred by the Nazi's in retaliation for partisan activity, though we never saw mention of equivalent events in Austria. 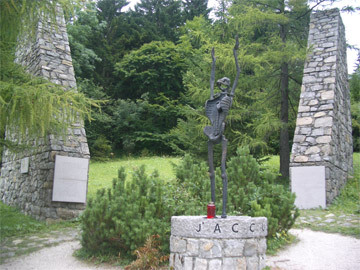 The Slovene's blunt memorial to Nazi-inflicted suffering. On the heels of traversing the tunnel that was built by people literally worked to death, was the high road going over Vršič Pass in northern Slovenia. It was built by WWI Russian POW's of the Austro-Hungarian Empire, of which Slovenia was a part. A memorial plaque at the pass and a write-up in our guide book made the sad bit of history perfectly clear. My guilt in benefiting from slave labor was growing, but I was at a loss as how to navigate in Slovenia with a dark history hanging over much of their infrastructure--history that other countries must politely ignore. By Day 10 in Slovenia we were using our 3rd piece of infrastructure that was built by forced labor. This time it seemed even more bizarre, as the WWI Russian POW's had built tourist walk-ways within an enormous cave of stalactites and stalagmites. In their honor, one of the cave's bridges was named the "Russian Bridge". Upon hearing of the Russian Bridge, I again slipped into my tourist remorse for being a socially irresponsible traveler in benefiting from the forced labor of POW's. Nowhere else but in Slovenia is such history of infrastructure mentioned, and another piece was just added to our growing list. As a way of dealing with my shame and conflict and of honoring the sad past, I engaged the young guide to tell me more. She didn't know any more details about the prisoner's efforts, but was quick to add that Russian POW's had built roads, bridges, and all sorts of wonderful things all over Slovenia. Contrary to our sense of shame, her tone was more of "Yes, they were great--everyone should have a Russian POW." Her casual attitude conveyed that they were an ordinary part of her country's history and that there seemed to be no guilt but instead a demeanor that said they'd been a good asset to own, like we'd speak of a modern convenience. The POW's memorial chapel to the avalanche victims. Her casual attitude, perhaps just a product of her youth, caused us to re-evaluate. There was no question that the Nazi's were exceptionally brutal in their use of POW's as expendable labor but we wondered if the plight of the WWI Russian POW's perhaps hadn't been so desperate. We thought back to the freshly renovated chapel part way up the tortuous Vršič Pass. It originally had been built by the Russian POW's to honor the death of their comrades and guards killed in an avalanche while building the road. Building a memorial chapel to their fallen was not something that Nazi POW's were allowed to do. And some days later, Bill pointed out a photo in the Kobarid museum that showed the Russian POW's working on our Vršič Pass road that were interspersed with their Austro-Hungarian guards. All looked well clothed, well fed, and equally content. Without the group photo caption, one wouldn't have had a clue that the subjects were other than peers. This particular look at the Slovenians' relationship to their darker 20th century history was jangling to say the least as we swung from tourist remorse for using infrastructure built by POW's to looking at the rather calm attitude the Slovenian's seem to have about their past. At the very least, it is clearly a part of their history and however it is internalized, it certainly isn't ignored like it is in Austria. Slovenia was the northwestern-most corner of the former Yugoslavia and was just east of the Iron Curtain dividing Europe after WWII. Though it was always the more prosperous region in Yugoslavia, it clearly suffered from being on the wrong side of the wall, and it's a difference that shows as you cross the border into Slovenia from Austria. That being said, Slovenia is the star of the Eastern European batch of countries to join the European Union (EU). It is the only of the newest members so far allowed to officially use the Euro currency on the street, as of 2007, and that is because it has the most solid economy of the bunch. And it was the first of its group of 'transition countries' to move from its borrower status with the World Bank to becoming a donor partner. Life is good enough to create roadside humor. Slovenia's historically better times continues to show as it has that buzz of an energized society on the move. The purple and then hot pink, tricked-out, VW bug's that we saw in the first town across the border seemed adapt symbols of their "let's get going" mind set. Slovenia's rate of smoking is down in the range of the US's at about 23%, which must be one of the lowest rates in Europe. As of this month, it's joined several other EU countries in banning smoking in public places. The average age of women having their first child is now almost 30. Condoms are marketed at the grocery check-out counter with the bubble gum and candy bars. Their 100% literacy rate is easy to believe and, luckily for us, English is taking hold as the unofficial second language. The roadside litter and general management of garbage is outstanding, especially in comparison with their more Mediterranean-minded neighbors. Long distance bike routes are being built and recycling bins are springing up. These and other social indicators that are easy for us to spot reinforce their image as a prosperous, focused country. But as before when in Slovenia, we immediately knew we were in Eastern Europe. The one-lane width of some sections of the through roads, the sometimes very shabby condition of the pavement, and the disregard for pedestrians shown by many motorists were early reminders of their different heritage. The poor quality of materials used in public and private spaces also spoke to a "catching-up" mindset. Our fairly freshly remodeled little room in the resort town of Bled probably wasn't right from the beginning. There was nothing unusual in what was amiss, except for how long the list was. The problems with just the bathroom included: a shower curtain that was too short and too narrow; a bathroom floor drain that was at the highest point on the floor instead of lowest; a shower head assembly that was just too cheap to have ever worked well; a toilet seat would only stay in the "up" position if held; a tiny speck of a sink that didn't hold water; and a bathroom light that only worked for about 10 minutes each day after the host fiddled with it. Hey, but we did have hot water and the toilet worked predictably. 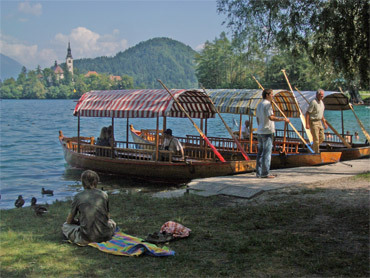 Lake Bled boats waiting for more customers. The standard of care for public spaces also repeatedly triggered the "Ah, we're in Eastern Europe" response. Here, like elsewhere east of the old divide, shattered concrete stairs with exposed rebar were a usual sight. And the all-metal playground equipment in the schoolyard where we paused for lunch our first day in the country could have been plucked from our 1950's childhood memories. Once painted in primary colors, none of it looked inviting today. Though they had added a classroom-sized, covered sandbox to the grounds. (However, the young lads on this Saturday clearly preferred playing on top of the roof, rather than in the sand.) . The "almost, but not quite right" button associated for us with Eastern Europe was pushed at the tourist sights too. The town of Bled and its glacier-formed lake is the #1 tourist destination in Slovenia, yet it wasn't as polished as we expected. It was developed and heavily used, but didn't exude the grandeur and pride we've come to expect when we are where the old money of Europe used to vacation. Among other things, the lack of a cohesiveness in the lake-side architecture detracted from the overall look. And elsewhere, like in the Italian Lake District or along Bodensee of Germany, one is greeted with occasional formal gardens, well-designed sitting areas, and uplifting promenades around the water. At Bled, the mostly functional quality of the loop around the lake left us wondering why they couldn't do better. And as we sat on a bench in the park outside the touristy 16th century castle above the Lake, one of our first Eastern European castles in the Czech Republic came to mind. It was the same "almost, not quite right" look. At both castles there was an unfortunately seamless transition between the dry, dusty, and a bit worn-out look of the naturalized grounds to the "maintained" grounds, instead of the sharp demarcation. 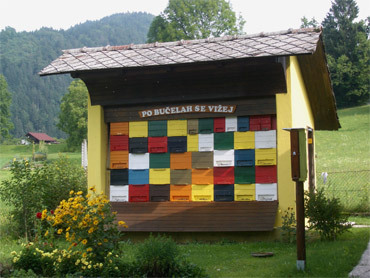 Again, it was that functional, good-enough look instead of the pleasing, inviting-to-linger ambiance that we expected. .
Bee-boxes: cottage industries are still important. The even farther-east memories of Turkey were triggered several times while in Slovenia. The poor quality of maps in both countries was wildly disappointing. In Slovenia, our road marked as a fine secondary road on the map turned out to be gravel instead of asphalt for most of its length. And the same road lacked any grade markers on the map unlike the smaller adjacent road, although there was a disappointing 18% grade sign that greeted us mid-way. (Fresh off of what was probably a mile or 2 of mostly 15-17% grades on an Austrian pass, we did surprisingly well, but that's not the "clean out the carb's" event we go looking for.) Oh, and then there was the matter of the names on the towns being switched on the road map, which adds to the challenges of orienting oneself. We do appreciate what Slovenia lacks in the stereotypic, Eastern European repertoire, and that's the residue of communist-era paranoia. Their long-time, post-WWII ruler Tito was less oppressive in his control of Yugoslavia than his communist counterparts and it shows. In northern-neighbor Czech Republic, some villagers would withdraw to their doorways when we rode through town, making us feel like the outlaw riding into town in the cowboy shows of our childhood. And in Czech we were careful not to be construed as photographing locals--people still stinging from the surveillance of secret police. None of that comes to mind when in Slovenia. 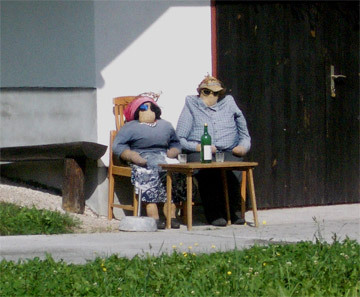 In contrast to other former communist nation peoples, the Slovenes seemed at ease and trusting. Rental bikes weren't locked up in front of the shop, nor were they locked when we saw the same bikes at a trail head. Our Lake Bled host explained that we had a key to the front door, but it was never locked. The shed where our bikes were stashed at night wasn't locked either. And when it came to evaluating whether I dare blatantly trespass on a homeowner's property for a photo, I decided it wouldn't be considered a threat. There was no gate or a fence and my sense was that it would be OK in Slovenia. It's not even an option in some places like Italy and Corsica where the heavy use of fencing made it hard to even pause in the shade and such trespassing would seem far too traumatic to risk on some Czech's. Our general impression of Slovenians continues to be that they are a confident, optimistic, and up-front people which makes it easy to be guests in their country, despite the hopeless feeling their language elicits in us. As travelers coming from the stunning natural beauty of the US West and Pacific Northwest, we have learned that we are hard to impress. We try to contain our snobbery and still visit the local "must see's", but not surprisingly, as we made our north to south arc of western Slovenia's premier tourist areas, it came up short like that of many other areas before it. . 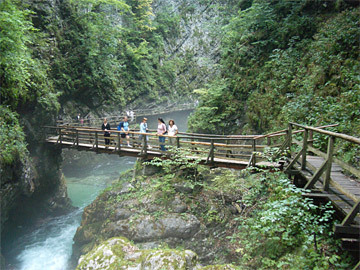 The raved-about Lake Bled area had its Vintgar Gorge walk, just like Austria had their developed gorge walk 30 miles away. We don't have exactly the same kind of scenery in Oregon and Washington, but all of the components are oh-so familiar: short segments of rapids in rushing creeks, small waterfalls, water-carved and tumbled rocks, and the lush greenery of a damp and shaded river. What is different about these compressed components in Europe is that unlike at home, they are spruced up for tourist sights, complete with entry fees. The Europeans build overhanging wooden walkways, install stairs and sell refreshments at one or both ends of these little gorges. At Vintgar Gorge, the almost 1 mile of walkways were in place by 1893. They don't go as far as to make them suitable for "handycaped" as the most recent Austrian sign stated, but they definitely make them suitable for family outings. 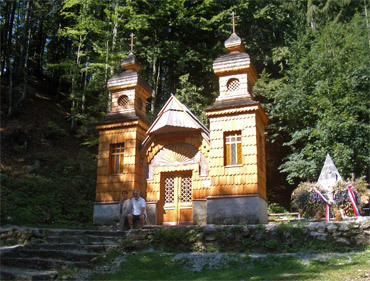 So, the Vintgar Gorge walk like Lake Bled itself with its island with a church on it, left us less than dazzled. But, it's what they've got and that's what we'd come to see so we saw it. 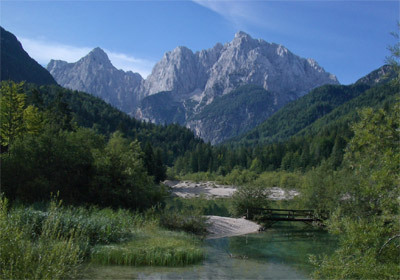 Jasna Lake at the base of the Julian Alps. The Julian Alps (named after an early visitor to the area, Julius Caesar) were the real "must see" on Bill's list for this visit to Slovenia but they, like what we'd seen of Austria's Alps, came up short. Yes, they were pretty and may get a second visit, but they didn't make it on to the Top 10 List of Destinations but rather are a site to see on the way to something else. It finally happened, it was as we were exiting Slovenia's Julian Alps that I was suddenly living one of the many little nightmare scenarios that my planner/worrier mind had scripted: I was rolling down the road in a camper or "caravan" with a couple of strangers and Bill was left in the dust on his bike. My bike was strapped onto the roof of the vehicle; my bags on the floor around me. Bill and I said "Good-bye" expecting to meet in front of the tourist info office in the next town. In the middle of Touring Season #7, we finally had our first show-stopper of a mechanical failure. Bill's diligence as a self-taught bike mechanic had prevented all of the customary ailments from occurring over the years, like brake or shifter cables snapping, chains breaking, or broken spokes incapacitating a wheel. And we'd been lucky with the uncommon failures, like a couple of cracked rims, as we'd been able to limp into a town with the injuries. But this one was different. This time I was stuck with coasting on the downhills and pushing on the flats and up the hills. Hours earlier when I was on the final stretch of 17% grade near the summit of the Vršič Pass in the Julian Alps, my gears had started slipping. Jarring and unruly, I didn't think much of it beyond feeling decidedly un-cool as the day-cyclists passed me by. Bill was some distance behind me taking photos so I settled on asking him for yet another rear derailleur tweaking at lunch. But eating in the warm sun and the hubbub of tourists and sheep at the scenic summit were enough for me to forget about the needed consultation. It was only upon resuming pedaling after miles on the steep descent that was I reminded of the problem. Bill was puzzled when we finally stopped for the tweaking as he'd already made several adjustments in the last week or 2. He checked for other maladies, like frayed cables and broken teeth on the chain rings. But as classically happens at the doctor's office, everything looked fine, it just felt terrible. I impatiently assisted in what surely must be a trivial problem as Bill buried his nose in the guts of the drive train as he turned the pedals and we slowly rolled the bike downhill. "All is in order" in German and Italian came out, but still no answer as to the cause of the malfunction. Bill rode slowly behind me to watch the rear derailleur and validated my symptom reports as the metallic clanging became startlingly more frequent. Then, the dreaded "Let's swap bikes" test occurred. Side by side, our bikes look quite similar but I feel like I'm riding a child's tricycle when on Bill's bike and he answers back with "How do you pedal on your toes?" 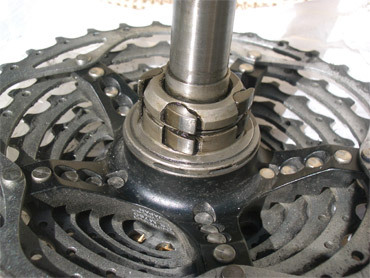 The always-quick swap advanced his thinking from the derailleur to the hub: either the grease was gone or an improper grease had been used in the hub assembly and it had now become too thick. It was beyond me how a dab too much or too little of grease could so suddenly cause the banging, clanking, and spasmodic lurching, but the logic held for the trained diagnostician. I pedaled on as best I could as the slipping and clanging progressed from an occasional event to one that disrupted about half my strokes. As Bill was working through the scenarios of attempting a repair on the road, I was plotting how to get off the road as quickly as possible. Bill flagged a passing cyclist who informed us that there was no bike shop in our next overnight town, nor for miles around. He also incorrectly said that after the next rise, the remaining 3-4 miles into town were all downhill. The town was definitely in striking distance, but being late Friday afternoon in high season meant getting in before dark wasn't good enough--we risked having no lodging if we didn't make it in before dinner time. In minutes, the status of my bike's ailment was changing from "annoying symptoms" to "inoperable." I soon found myself optimizing coasting on the downhills and having to push even when it was flat. Amazingly, pedaling wasn't producing any forward motion at all. I put out my thumb in the universal hitchhiking position as I trudged down the road pushing my bike. I thought an old lady pushing a bulky bike would be a compelling sight, but no one stopped even to inquire. I told Bill to start looking for someone to ask for a ride, perhaps friendly looking folks parked for a snack at a picnic area or a rural homeowner with a suitable vehicle. I wanted to get a ride rather than risk hours on the roadside jury-rigging a repair. I had great confidence in Bill's diagnostic and repair abilities, but just didn't feel we should risk the small chance of failure if there was another option. I'd spotted a camper with German plates parked across the road but the very athletic, middle-aged man hopped in his cab too quickly for me to engage him. I coasted on and watched in my mirror as he made a U-turn and headed my way. He obliged me by stopping when I flagged him down and his college-aged son responded with a clear "Yes" when I asked if he spoke English. Another clear "Yes" came back without discussion when I asked if they would give me and my ailing bike a lift to the next town. Bill pedaled back to us and helped me load my gear into the camper while the German duo tied my bike on the roof where their kayaks would soon be. Bill jotted down the license plate number and waved good-bye as he was left to pedal into town. I felt quite comfortable with my situation as I had decided that the likelihood of mischief from tourists was lower than that from locals who had more resources to draw upon to make trouble. The father and son were on a kayaking trip and their bikes strapped on the back were a reassuring symbol of shared interests. The son had gone to school for a year in Nebraska and papa's English was up to staying in the lively conversation. I gulped as we rolled up and down several hills on this "downhill" route--hills that I would have been pushing up were it not for their kindness. It wasn't long and they were unloading me, my bike, and gear on the corner near tourist info as I'd requested and they were off. Lodging was tight but Bill (with his ever-useful German language skills) found us a room for 2 nights, which would give us a full day to work on my bike. If it wasn't repairable, we'd stay longer and take a bus on Monday to a major city to buy a new wheel. Fortunately, the tourist info folk's huddle had yielded an outdoor adventure shop that they thought had a bike mechanic and we were on their door step when they opened the next morning. The troublesome pawls look like 4 pairs of flappers. We didn't really want the mechanic, but instead wanted access to his workbench. As expected, the mechanic didn't recognize our exotic hubs as the non-factory-sealed "Phil Woods" that could be repaired. He did however allow us to use his space, and Bill dug into the hub. Just as he expected, the several year's old grease was now so thick that the springy "pawls" were frozen in place and couldn't engage in a gear-like fashion as the wheel went around. Amazingly, all of my pedaling effort was dissipated as wasted energy because of an 1/8th of a teaspoon of the too-thick grease. Bill's diagnosis was right-on, as was his confidence in being able to fix it. In hindsight, he would have been able to make a swift and complete repair on the road. The cure didn't even require the solvent bath we'd hoped the mechanic would have but didn't--persistence with our pile of paper napkins was good enough to remove the glop. And the mechanic also didn't have the specialized light weight grease that was needed so Bill was stuck using our chain lubricant. Our string of good luck continued to come on the heels of this unfortunate mechanical failure, as later that afternoon we ran into a British couple we'd spoken with a few days earlier. They'd traveled over the same steep passes in their rental car and endured the same horrific downpours since parting and were eager to compare notes. At the end of the conversation, we learned we'd been talking with an engineer who was quite able to explain my sudden mechanical failure. He said that grease is really a soap that serves as a time release capsule for a lubricant, and that the lubricant does its job by slowly seeping out of the soap. At some point, the last of the lubricant is gone, leaving only the now-stiff soap behind. The grease the mechanic had used on my hub was likely too heavy to begin with and time plus the heat transferred from my nearby disc brakes had finally stiffened the soap to the point of locking my "pawls" in place. The heavy braking on the last, steep descent from the pass had triggered the rapid, final failure of a grease already on its last gasp. We knew that Bill's wheel had been assembled by a different mechanic and weren't surprised when breaking into his hub revealed acceptable, though aging, grease. Undoubtedly his hub had the right, or at least a better grease in it. Had his wheel hub had the same product as mine, it would have failed earlier as he both uses his rear brake more than I do and his total load is heavier. Not only had Bill been able to readily fix the problem, we now had more clarity about the cause and the solution that we'd ever hoped to get from the mechanics once back home. The next morning we headed out of Bovec, our bike-repair lay-over village, with confidence that our mechanical problems were behind us. At this point, we'd completed our westward journey across half of the northern portion of Slovenia adjacent to Austria and would now be touring south along its western border with Italy. The "must see" sites that seem to be weighted to this end of the country came up almost daily as we headed south in this country that is about the size of Wales. The online and TV weather forecasts predicted that the storm which caused flooding in Spain would hit hard in Croatia, bringing heavy rains, lightning, and high winds. We followed the reports for 3 days and decided to find a nicer tourist apartment and hunker down for 2 days and 3 nights rather than be on the narrow roads in the storm. But....it seems that the storm was a bust. Heavy overcast, a few showers and a few gusts today made us feel a bit foolish for sitting it out. But once again, another unexpected Croatian lay-over has been good for catching-up on our chores. So another webpage update was completed, another "roll" of digital photos has been culled, and Bill is pleased with his time spent studying German. We'll be in Dubrovnik in a few days. After sightseeing there and checking the weather report, we'll board a ferry for Bari, Italy. There we'll bike across the "boot" of Italy, then take a ferry to Sicily. There is even talk of flitting over to Tunisia for a few weeks without the bikes, depending on the late fall weather. We haven't sorted out how we'll get to Frankfurt from Sicily, but we'll be back in the States at the end of the first week in December.